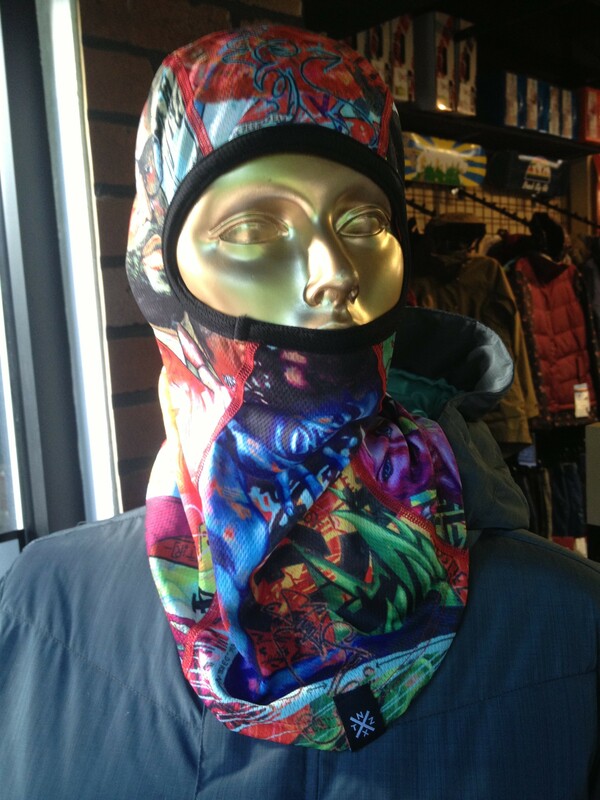 Face masks, neck tubes, bandanas, they’re all integral to having a fun time on the mountain when you’re protecting yourself from the elements. NXTZ is one of the brands at the forefront of making an American made product that is functional yet fashionable, these aren’t your parents gaitors! We sent Kevin out into the elements to test out a few of their models and he came back with this super review. 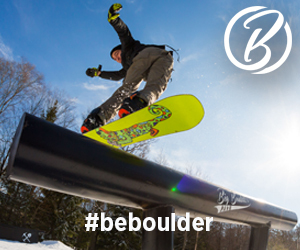 Conditions/Location: 5 to 15 degrees, Breck. Comfort: Very very comfortable. Slip it on, wear it under the chin, over the mouth, or all the way over the nose. It stays in place without tension needed anywhere. You could wear this to bed. Dry Time: Dry-Tx mesh is great. With full on huffing and puffing into the single layer mesh it dries in less than a minute. Never had an issue, I doubt I ever will. Warmth: Definitely the warmest single layer facemasks I’ve worn. 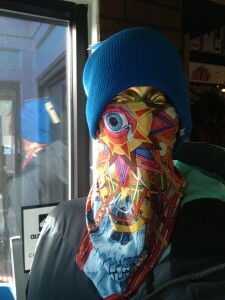 The nice thing about balaclava’s over tubes is that they don’t need tension to stay up on your face. This means they can fit just a bit loose and trap just a little more air. More trapped air means insulation and more warmth. If you just need to be warm nothing really beats a balaclava. Breathability: Super breathable. 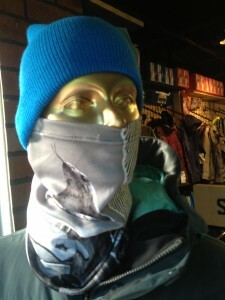 Balaclava’s are almost expected to be worn over the nose and under the goggles. This means sub-par fabrics in balaclava’s is just a bad idea: if it doesn’t breath well, it’s going to fog, and people will hate it. I don’t hate this one. Dry-Tx breathes really well and even with heavy breathing standing in a lift line I didn’t fog. Best For: Really cold days and over the nose fit. 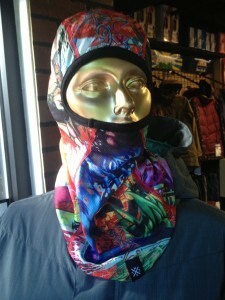 This is what I’ll be wearing on powder days and anything below 20 degrees. It’s just super comfortable, keeps me warm, and is the best thing I have to wear over my nose. Conditions/Location: 10 to 30 degrees, Breck. Comfort: The Dry-Tx material is nice against the skin, but I just hate bandanas. They don’t stay put and when I wear a mask I want it to stay put and keep my face and neck covered. Compared to a standard cotton bandana this is heaps better though. It does have stretch to it, but the only way to keep it up was up across my nose, and even then it had to be too tight and ended up giving me a headache after a while. Dry Time: The Dry-Tx mesh is awesome in this department. Less material means less moisture gets trapped. Less moisture to get rid of means shorter dry times. Yay Logic. Warmth: The mesh is dual patterned as far as I can tell. It’s probably the warmest single layer mask out there that isn’t straight fleece. Breathability: Mesh has holes. This means there’s areas that let air and moisture through unimpeded. So, mesh is breathable. YAY SCIENCE. Really though it lets you breath fine and doesn’t get heavy on the neck. actually perform in wintery conditions. Comfort: As comfortable as a bandana can be. They some sort of micro velcro on it that doesn’t snag on anything other than the other Velcro side. This means you don’t have to worry about it snagging on a beanie or your hair. If you like Velcro-ed bandana’s this a great feature. Dry Time: Fantastic. Spandex alone doesn’t hold onto to moisture, then put NXTZ’s Dry-Tx mesh on the inside to keep the moisture from your face off the spandex, it dries fast. Less than a minute after heavy breathing and some face shots. Warmth: Warm in the front, but it’s a bandana so it doesn’t do much for the back of your neck. If that’s not a concern for you the dual layer spandex/Dry-Tx is superb. I’ve never gotten too hot in it, and it always keeps me warm enough to stay out on super cold days. Really the best fabric I’ve used for an everyday mask. Breathability: Part of what helps this masks dry time is the breathability. It doesn’t hold on to breath moisture nearly at all, so if it does get wet at, it has plenty of opportunity to dry. Never cause me to sweat on my neck either, pulls away any skin moisture. Best For: Someone that just really likes the bandana fit and wants something easy on/off and techy. I don’t get bandanas. They leave the back of your neck open to the elements and I just don’t like that as it gets cold. 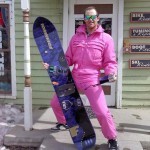 Conditions/Location: 5 to 40 degrees, Breck/Keystone/A-Basin. Comfort: All day comfort, first chair to last chair. 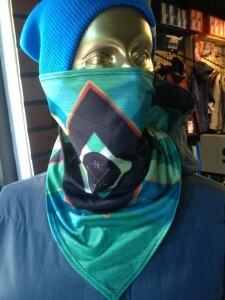 Like the 2L I primarily wore this one balaclava style. As a straight up neck gaiter it just sorta crumpled up down my neck and didn’t provide any benefit. Dry Time: After some heavy breathing and/or snow melting on it the Dry-Tx mesh in the 1L dried pretty fast, impressively so actually. The mesh is great for this so if you’re a heavy breather this one’s great. This also means it won’t hold on to breath stench as much and thus stay fresh longer. Warmth: This is probably one of the most versatile masks I’ve worn. It was warm enough on all the cold days I’ve worn it on to keep me from being uncomfortable, but not so warm that I wanted it off on the warmer days. Breathability: It’s mesh. What mesh isn’t super breathable? This is what aids the dry time and what helps keep the moisture from grabbing onto it in the first place. The mesh lets the pressured air coming out your mouth through, but still “traps” air everywhere else so it stays warm. Best For: Every day wear. If you wear a face mask regardless of what the weather is doing and you aren’t in a super cold climate, you should probably own one of these. my local shop backs these dudes hard. Is it pronounced “Neck Steeze?” or maybe ‘Neckstacy”? It’s actually pronounced Hector Elizondo! I know totally blew my mind. I’ve been going with NEXTEEZ.